We’re all about making magic at BRAVA Marketing, for sure, so it’s no surprise that we make such a candid and blunt prediction that foam novelties are THE THING in business! Joke? No. Okay, maybe a little bit. 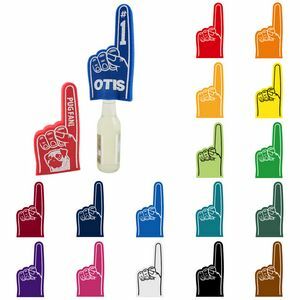 After all, how in the HECK would a foam novelty (you know, those foam hands you wear at basketball games to cheer your favorite team?) make any kind of money for a business? At least in the long run. And when you want consistent, constant revenue. The long run is what matters. You don’t want a fad. You don’t want to focus on a gimmicky trend that’ll last a few months. Instead your focus should be on the long-term investment, which is why these particular businesses/organizations/events make all the difference when including something as minor as…a foam novelty (don’t laugh!). How About a High School? — Think about it. Who doesn’t love the high school football team, and what better way for the boosters to raise money? Check it out. 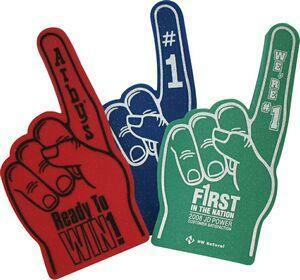 Company Functions — You’ll be blown away with the idea of leveraging foam novelties as a way to promote employee morale in your business. Sports Bars — This one honestly could easily be a no-brainer, but read this anyway, take notes, and let the creativity build. And you can imagine that after looking at the possibilities, you might find that BRAVA Marketing’s selection of foam novelties right here might unlock a lot more potential in other industries! Who knows…. After all, it means there’s a party! And who doesn’t love a party? Not BRAVA Marketing. So contact us right now and get started. If there’s one thing fueling the funding and excitement of sports team in high school, it’s obviously this: the cheering! You know the drill: you have the boosters, they’re designed to get people excited about their high school sports teams. They raise money. They help fund everything the players need, from uniforms, to sports equipment, to even medical supplies. So why custom foam novelties? What good would those do? Because Boosters in High School Are Made Up of Those Individuals Who Matter: PARENTS! Seriously! That should’ve been a no-brainer. There’s no better cheerleader, no better supporter of any sports team than a parent. They’re the ones who would be honestly wearing those custom foam novelties. Concessions could even sell them and make some ROI from the investment. But the point of having them is to get some good alma mater excitement going. 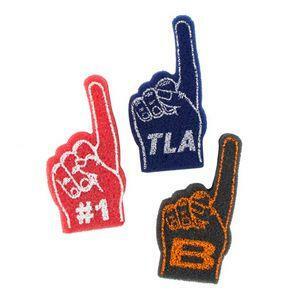 So think of this from a high school administration’s perspective — buy some custom foam novelties with your brand, your logo, your MASCOT printed on them, in bulk, at a lower cost, sell them to those who really care about the team (even more so, the son or daughter on the team! ), and even give some away for free to those who support the teams, such as the boosters! That’s a win-win. That, my friend, is a no-brainer. We arguably don’t see much of that in high school, probably because back in the day and age of sports distribution for those types of products were only available for the large-scale sports centers charging a hefty fee for a ticket to watch the Chicago Bulls play at the Allstate Arena. But high schools? There’s only so much of a budget, which is why you definitely need to see what we’re all about at BRAVA Marketing. You can check it out right here. Find a style you like? CONTACT US! We’ll get you all set up with the custom print you want. Bear in mind that the more cheer your team gets, the better chance they’ll fight even harder to win! And nothing beats seeing your alma mater win the big game.